Building element set for the MDF panel construction kit #90350. *) The stated RRP corresponds to the sum of the individual prices of the windows, doors and the staircases contained in the component set. Roof dormers, shingles and tiles are not included in the building element set. For the exact internal dimensions of all the rooms, including the room heights in the various levels, please see the image with the detailed dimensions. The construction kit (90350) includes - all - of the wood sections for the walls and floor made from MDF material (Medium Density Fiber panels) which you need to build the "Large townhouse" with folding roof. The MDF panel construction kit includes - EVERYTHING - it's ready-to-go and the milled-in grooves for all of the walls and cable ducts allow even the inexperienced to build the house without tools. The MDF construction kit does not include the shown building elements (90320) and lamps nor the wallpapers. 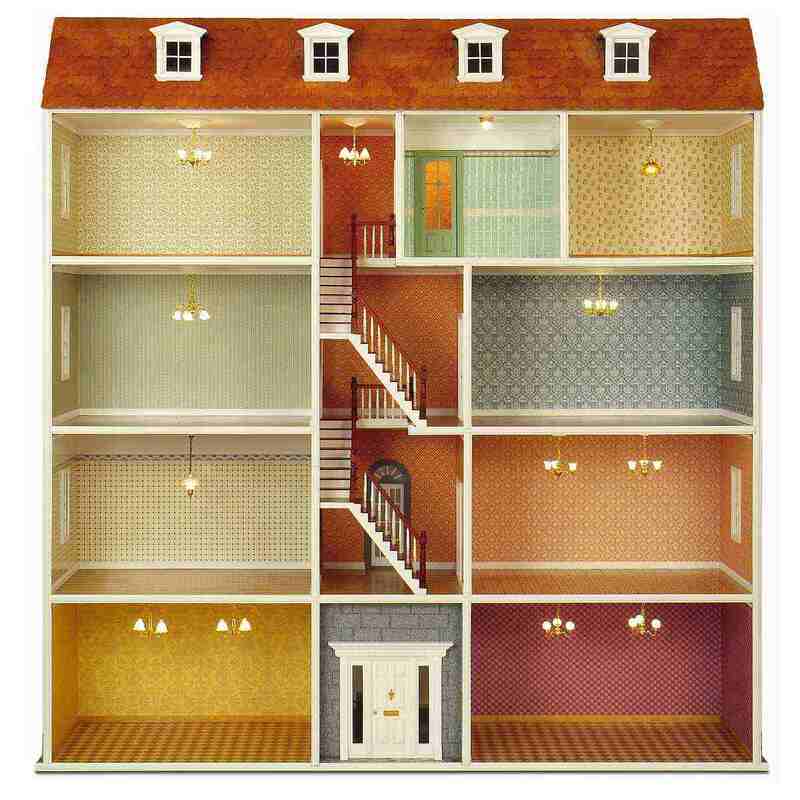 The matching components (windows, doors and a staircases) are included in the set of building components (#90320), but they are NOT included in this MDF construction kit. The roof can optionally be equipped with 4 dormers (50370 / 50371) as shown in the picture. The roof can optionally be laid with the easily mounted roof shingles (70050 / 70055) or with roof tiles (70040 / 70045), whereby the cutting of the tiles is somewhat more complicated. A sharp-edged side cutter or our precision saw (44100) is recommended for this. If you would like to install the roof dormers (50370 oder 50371) shown in the picture on your attic floor, we additionally recommend the narrow roof shingles (70020 / 70030), of which you will need 25 pieces for each dormer. You can optionally cover the roof with "roof cardboard" = rough sandpaper.